This sculpture is Thorvaldsen’s breakthrough work. 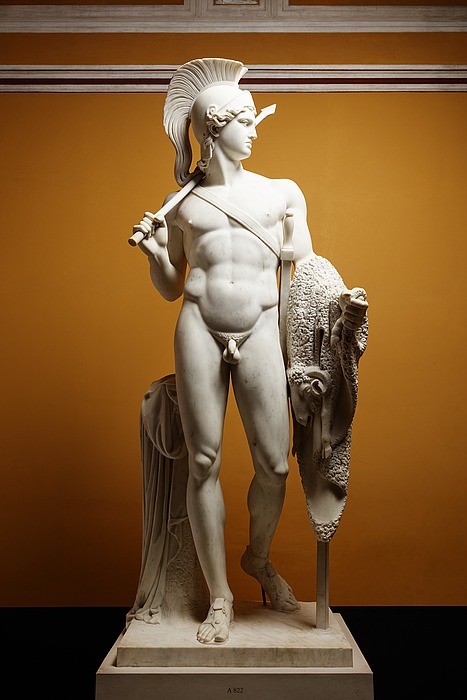 Jason was begun in Rome in 1802; finished in plaster and commissioned in marble by the rich English patron of the arts, Thomas Hope, in 1803; but only delivered 25 years later. This sculpture is Thorvaldsen’s breakthrough work. Jason was begun in Rome in 1802; finished in plaster and commissioned in marble by the rich English patron of the arts, Thomas Hope, in 1803; but only delivered 25 years later. Jason was a Greek mythological prince whose wicked uncle Pelias had unjustly taken power from Jason’s father, King Aison. To win back the throne, Jason needed to obtain the Golden Fleece, which was guarded by a dangerous dragon in a far-off land. Jason sailed off with his men to find it, and after surviving numerous dangers and challenges, the brave young man and his comrades finally found the Fleece; this sculpture depicts the proud Jason at the moment where, with the Fleece draped over his arm, he is going down to the ship that will return him to his fatherland. The Fleece was magical, and guaranteed fertility and wealth to the land that possessed it – so by obtaining it, Jason established that he was not only a prince in name, but indeed, equipped to rule his land in the best possible way. The notion that a person’s station in society is not determined by inherited privileges, but by his or her human abilities, is a fundamental democratic principle. As is well known, classical Greece was the cradle of democracy, and Thorvaldsen’s Jason made its appearance on the artistic scene at precisely the moment when pro-democracy sentiment was making a powerful impact in Europe. To Thorvaldsen’s contemporaries, Jason made clear that the neoclassicist Thorvaldsen had succeeded in breathing new life into classical antiquity with all that indicated – including for the hope for freedom in the future. Hope’s marble version of Jason was purchased by Thorvaldsens Museum at an auction in England in 1917.